The story of St. Martin's begins on October 24, 1950, when The Reverend Mark T. Carpenter, then Rector of All Saints Parish in Ft. Lauderdale, received authorization from The Rt. Reverend Henry I. Louttit, the Bishop of the Diocese of South Florida, to start a mission in Pompano Beach. The approval of a mission parish culminated the hard work of numerous Episcopalians in Pompano Beach. Almost two years prior, on March 2, 1948, a meeting was held in the home of Mr. and Mrs. Horace P. Robinsons. Present at the initial meeting were The Reverend John K. Collidge, then Rector of All Saints Parish, Mrs. R. Purdy Markland, Mrs. James Wilson, Jr., Miss Effie Power, Mrs. Anne C. Palmer Sheldon, Mrs. Clifford Clark, the Ford sisters, Mrs. Grace Odum, Mrs. Emma Lou Showalter, Mrs. Gertrude Vanderzicht, and Mr. and Mrs. Eugene C. Hedges. Their faithful work would soon bear abundant fruit. 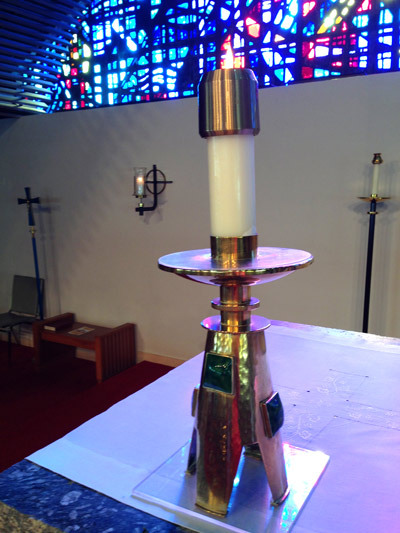 Candle on the Church altar. This meeting was followed by many more, and finally produced the first worship service of St. Martin's Church in the Chamber of Commerce building on Sunday, October 27, 1950, at 3:00 p.m. On December 17, 1950, the Reverend E.A. McIntosh (a retired priest, here for the winter) celebrated the first full Service in the Chamber building, at 11:00 a.m.
On January 2, 1951, St. Martin's became an organized mission of the Diocese of Southeast Florida, and in the same month the Vestry of the new mission was chosen. The first Vestry of St. Martin's Church was composed of Horace P. Robinson (Sr. Warden), Horace P. Robinson (Jr. Warden), A.J. Musselman, Jr. (Secretary), Eugene C. Hedges, Ernest Wooler, John B. Trumbull, Lynn B. Timmerman, and John Olah. This Vestry proposed an operating budget for the year of 1951 in the amount of $1,414.00 including a diocesan assessment of only $175.00. This budget contained a proposal for a building fund of $10,800.00 for the first church of St. Martin's, Pompano Beach. $10,000.00 of this proposed building fund was loaned to the church by the Diocese in a noninterest-bearing note, payable at $1,000.00 per year. How did we get our name? A small wooden-frame church was floated down the Intracoastal Waterway from Jupiter to Ft. Lauderdale to become the first house of worship for All Saints Parish. That church had been called "St. Martin's Church". When the people in Pompano wanted to form a congregation under the guidance and leadership of All Saints, the people of All Saints requested that they call themselves "St. Martin's Church" to perpetuate the name of their original church. Therefore, when the congregation was chartered under the laws of the State of Florida, its corporate name was and remains to this day St. Martin Episcopal Church, Pompano Beach, Florida. Early in 1956, Mr. Ernest Wooler, who had for many years been an engineer with Rolls Royce, Ltd., went to England by special invitation to participate in a Rolls Royce anniversary celebration. At that time the famous London Church of St. Martin-in-the-Fields, Trafalgar Square, was raising money for the rehabilitation of the church for damage suffered during the great London Blitz in World War II. Very shortly afterwards, St. Martin's became known as St. Martin-in-the-Fields, and has been called that until recently. We have returned to our original name of St. Martin.